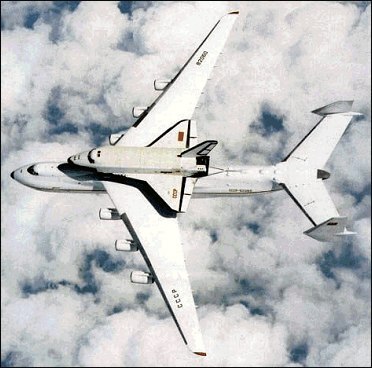 The An-225 Mriya (dream) stemmed from the need to transport large items for the Soviet space programme. In mid-1985 Antonov began the design and the An-124 provided the basis for the new aircraft, Antonov using many of the same components to keep cost and development effort down. Standard An-124, wings are grafted on to a new centre section, thereby increasing the span while keeping the engine installations the same. An additional pair of D-36T turbofans is fitted to the new centre section. The cabin retains the same cross-sectional dimensions but with increased length, and to save weight the rear loading ramp is removed, but the An-225 retains the nose visor. To support the increased weight, seven pairs of wheels are fitted to each side as opposed to five in the An-124. Outsize loads are carried 'piggy-back', the load supported on two main attachments above the centre section. These supports and other smaller ones along the fuselage top are faired over when not in use. 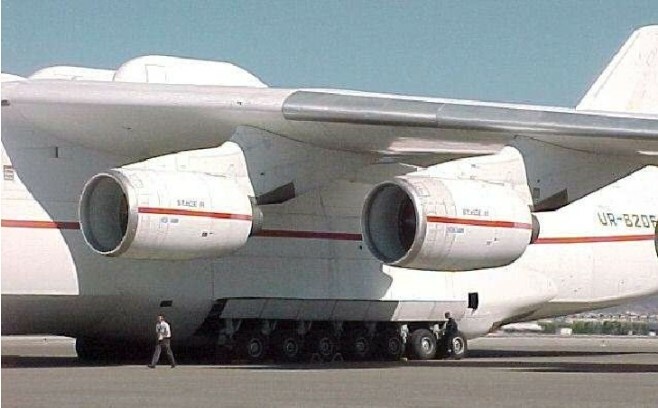 To avoid buffeting from the 'piggyback' load, the An-225 has twin vertical fins mounted on the end of a large tailplane. The prototype made its first flight on 21 December 1988 from Hostomel Airport outside Kiev, Ukraine, and the first flew with Buran on 13 May 1989 from Baikonur cosmodrome. 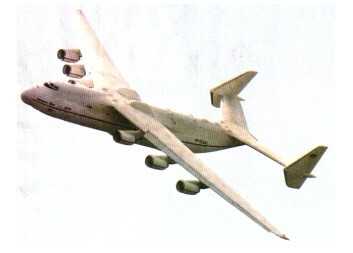 This combination appeared at the Paris air show in 1989, car-rying the 62.1 tonne (136,684 lb) Buran on its back. In March 1989 the An-225 set 106 world and class records in one flight from Kiev, at a maximum take-off weight in excess of 500000kg. On its record-breaking flights, the huge An-225 took off at an all-up weight of 508,200kg. Typically, the An-225 carries two pilots, two flight engineers and two navigators, the flight system incorporating fly-by-wire controls. NATO name Cossack. The Antonov An-225 has been extensively modified since 1988 with its six engines being updated and a strengthened fuselage being among the many changes. The first commercial flight was performed by the An-225 in May, 1990. A T-800 tractor weighing more than 100 tons was delivered from Chelyabinsk to Yakutia. After the collapse of the USSR the only plane stopped flying in 1994 and some parts were disassembled to be used on other planes. However by the 2000s it was restored by efforts of some Ukrainian companies. The airliner was amended a bit to meet the standards of civil aviation first flying aain on the 7th of May, 2001. Antonov planed to finish building a second An-225 if they have financial support. 70% was ready; the centre wing-section, fuselage and a wing remained since the Soviet times. If they had a customer they would finish it, requiring $150 million. Internal cargo hold: 43m x 6.4m x 4.4m.